First, I would just like to say that I love Orsen Scott Card. I didn't enjoy Ruins as much as Pathfinders but I did enjoy the philosophical (sometimes paradoxical) discussions on the nature of truth and lies. Throughout most of the novel, I was annoyed with the constant bickering, and at how stupid, selfish and absurdly egotistical the three children were being but then I realized that they were merely being children. The characters themselves were more likeable in the first novel but more realistic in their flaws in this one. Overall, a good read. 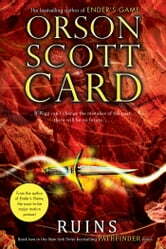 I liked that this book is a combination of fantasy and science fiction. It had me gripped and I couldn't put it down. I was a little disappointed in how it ended, as it's hard to tell if the series will continue, but there were many questions left unanswered. As engaging as the first volume. I am looking forward to the final volume.